Chicago Public Schools needs a lot of help from the state if it's to stay solvent. Namely, $500 million in pension relief. Gov. Bruce Rauner on Thursday said he's ready to ride to the rescue, but there's a catch: The mayor must persuade lawmakers to give all towns and school districts the ability to limit collective bargaining with public employees. 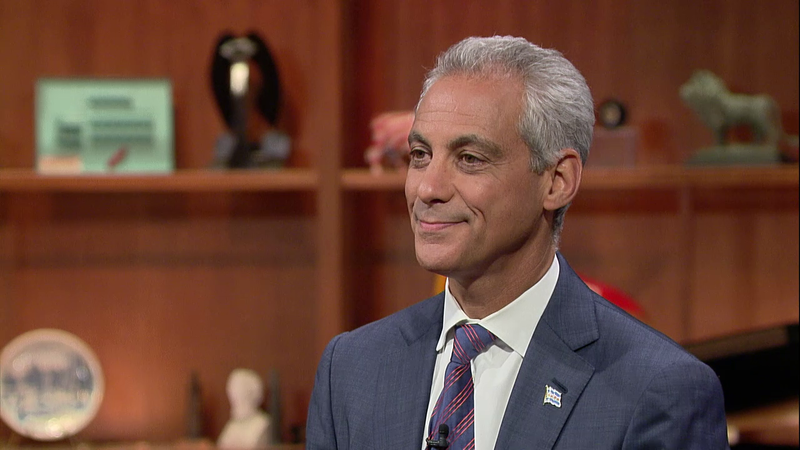 Chicago Tonight asks Mayor Rahm Emanuel for his response to Gov. Bruce Rauner’s challenge. Emanuel also discusses a new agreement between the Chicago Police Department and the ACLU. Condensed highlights from the discussion are below. To hear the full conversation, watch the video. "Three months ago, the governor was at City Council. I said then, I'll work with him on workers' comp reform, one of his key items. I stand ready to work with him. I've said that publicly. The city of Chicago has a self-interest in that because we're the largest employers. I don't think that children of the city of Chicago should continue to be played as a pawn in another agenda item. I don't agree with "right-to-work." I do agree with workers' comp. I said I'd work with him on it. One of the big challenges down in Springfield is [that] everything is trying to be held hostage to items that you can work on. The governor has to understand, in working together with all parties, there's a way to get this done, and I stand ready to help, specifically on workers' comp. What's happening here, and the reason there's no progress, is a lot of name-calling and a lot of finger-pointing." "There's progress being made. ... Sen. Cullerton's bill got the ball started with a significant step forward. Speaker Madigan said we have to address the inequity in the school funding system. One victory begets another victory. Springfield's been ground to a halt. Get the budget done. Address the inequity in the pension system, and we start having victories and we start making progress. That's how you move this state forward. What I propose, is that the state finally starts paying, like they do for the other state payments. I would ask the taxpayers to step up, and ask the teachers to step up; everybody would do their share, to stabilize the finances and -- more importantly -- ensure our teachers get a pension where everybody contributes to the solution and the big winners not only are our teachers and our taxpayers but we also then stop this process of cutting and borrowing as a way to stabilize the finances because the state has to be a partner. The effort here is a comprehensive solution, which I think is all being addressed -- one way or another -- but we've got to finish the job now." "Community policing, when I became mayor, became an office, rather than an operative philosophy. Everybody's now practicing community policing. You can see it manifested from police officers being baseball coaches, to other types of activities, to every stop is a teachable moment. We've reached a landmark agreement between the Chicago Police Department and the ACLU, for reforms to what's commonly known as "stop-and-frisk." It's the first time [such an agreement] has been reached between the ACLU and a police department without either a lawsuit or the intervention of the Department of Justice. A lot of progress has been made by our police department, [but] we have to always be open to making improvements, because that effort -- as it relates to "investigatory stops" -- is part of also ensuring that the public trusts the police department, and the police department is working with the community. We have a real agreement today, going forward, of how to monitor -- how to make sure that the reporting and the recording of these events -- are consistent with the philosophy that I think is essential: Policing effectively, and upholding people's civil rights, are not mutually exclusive, but they're complementary when done right." Below, an overview of some key topics for our conversation with Emanuel. Thank you to all readers who shared questions for the mayor with us. The beginning of the academic year is about a month away. Chicago Public Schools is facing a $1 billion shortfall and is preparing a budget that relies on $500 million from the state, which is mired in a budget stalemate. On Thursday, Gov. Bruce Rauner said his administration would be willing to help Chicago Public Schools and the city’s pensions, provided he gets what he wants from the city. Watch the video below to hear his offer. On Monday, CPS CEO Forrest Claypool discussed the district’s precarious finances on Chicago Tonight, saying “We can’t protect the academic gains we’ve had in the last few years under Mayor Emanuel unless we fix the finances. We don’t want to go backwards, we want to continue going forwards, so fixing the finances of the district is priority one. Earlier this week, Illinois Senate President John Cullerton’s plan to have the state alleviate $500 million of the district’s teacher pension costs advanced to the House of Representatives where its future is uncertain. Another unresolved issue ahead of the upcoming school year is a new one-year contract for CPS teachers. The latest contract expired on June 30. Claypool has said the talks have “ebbed and flowed,” with the latest sticking issue being teacher evaluations. Claypool has also said that teachers will have to pick up the full cost of their pension contributions. For years the city has picked up 7 of the 9 percent contribution required of teachers. “I don’t see a solution that does not involve the teachers paying the 9 percent, which is consistent with what teachers around the country and other public employees pay,” Claypool said in a recent interview with the Chicago Tribune. Late last month, Cook County Circuit Court Judge Rita Novak struck down Chicago’s pension reform for two of the city’s four pension funds. In her ruling, Novak cited the recent Illinois Supreme Court ruling that found the state’s landmark 2013 reform law as unconstitutional on the basis that entrance into a pension system is a “contractual relationship” where benefits cannot be diminished or impaired. The city’s 2014 pension reform law cut benefits from the city’s municipal and laborer retirees and increased employees’ contributions to the funds while increasing taxpayer payments into the fund. Following last month’s ruling, city attorneys requested Novak wait to enforce her order pending an appeal to the Illinois Supreme Court. Novak denied the request, stating, “I don’t see there is much likelihood of success on the merits at all once the case reaches the Supreme Court,” according to a Chicago Tribune article.